Are you using Google+ to promote your brand or content? Do you want to find Google+ fans who love what you do and will share it with others? When people share your stories, campaigns or products with their friends, they’re giving it their stamp of approval and their friends take notice. This word-of-mouth marketing is invaluable, but how do you find these super-fans? In this article, I’ll show you how to use Google+ to find the evangelists who want to tell the world about you. How Do You Find Your Best Fans? As a marketer, you want to find people who engage with your message and amplify it, spreading it on to others. These loyal fans, your brand evangelists, fall in love with your company and tell the world. Google+ can help you find and engage with your evangelists, and lead you to a wider pool of potential clients. The process includes finding potential candidates, seeing which of those actually engage with your campaigns, and finally, those who share your campaigns with others (your true evangelists). 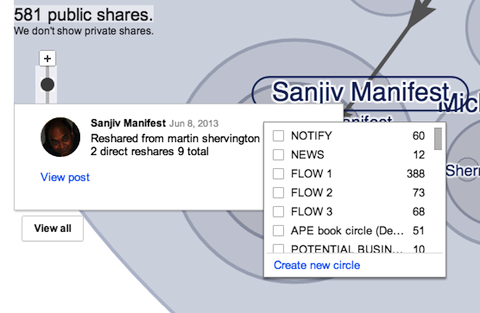 Before you start your search, create three empty Google+ circles to help you keep track of your evangelist candidates. Tip: Add these circles to the beginning of your Circles page so they’ll appear on your home stream navigation bar. When you add people to each circle, you can click and access their content from the bar. Change the order of your circles on the home stream navigation bar. Now that your circles are in place, it’s time to start vetting your evangelist candidates. Below I explain how the process works. To begin, you need to search for people who are talking about your brand, product, topic, etc. The first 100 people you find probably won’t all be true candidates, so you want to cast a wide net. Try to build a pool of around 200 people for your potential candidates circle. 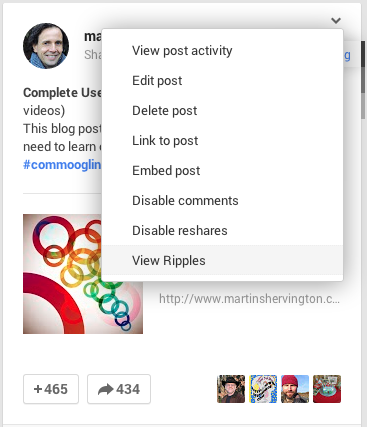 Start by searching within Google+ for content. Use hashtags or keywords that are related to your business, brand or niche. For example, search for the hashtag #socialmedia. You can filter your search, including search options, under the More tab. Search to find out who’s talking about your topic or business. The search results will show the hashtag you searched for, as well as related hashtags. 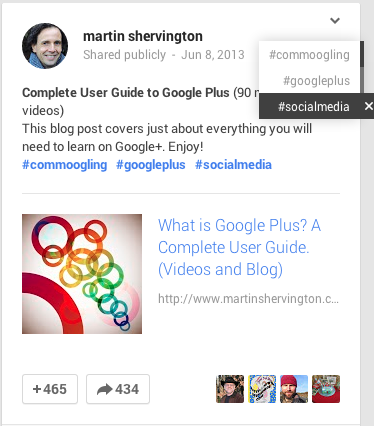 You can click on the hashtag(s) to flip the card and find more related content posted by other Google+ users. Click on the hashtag to flip the card over to find more prospective evangelists. After you flip the card, scroll through the results and review the level of engagement on each person’s post to get an indication of their influence. When you find a candidate whose post has a reasonable amount of engagement, click on the arrow in the upper-right corner of the card and choose View Ripples at the bottom of the list. Click the upper-right corner to find the menu. 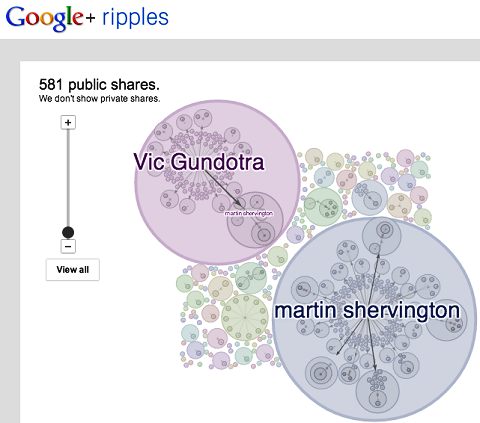 Ripples are a visual representation of the public shares a user’s link has generated. The larger the circle of a sharer, the more relative influence he or she has. Browse through the ripples on other people’s content to find the influencers for your niche. Ripples give you an idea who the influencers are for that content. Tip: Don’t forget to look at your competitors’ pages. If they have the Who Has Them in Circles feature showing, take a look and see which of their audience members may fit into your potential candidates circle, then check them out. Watch this quick video to discover more about Ripples. Any time you find someone you want to add to your potential candidates circle, hover over their name to bring up your Circles menu, then choose which circle to put them in. For our purposes, put them in your potential candidates circle. Add people who seem to be influencing others with outward ripples. When you add people to your potential candidates circle, don’t wait to start interacting with them. View some of the posts they’ve shared, then comment on the most relevant one. Introduce yourself and if they’ve been talking about your brand, thank them. Another place to continue your hunt for candidates is Google+ communities. Most communities allow you to join immediately and once you click in to look around, you’ll find more people and content to review. Check out relevant communities to find more people to add to your potential candidate circle. Now that you know who’s sharing or mentioning your brand on Google+, it’s time to broaden your search, literally. Go to Google search and run a few typical queries you’d expect from your customers. The results will show people who write on the subjects that align with your brand. Tip: Make sure you open up a private/incognito window if you want non-personalized search results. 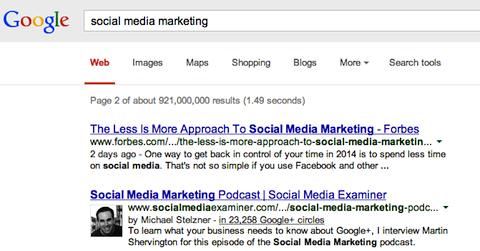 In the search results, thanks to Google authorship, you’ll find people’s Google+ information next to their content. Generally, you want to look for writers who have been circled by a large number of people. Click on the author’s circles in the byline to see his or her Google+ profile. Click through to the author’s Google+ profile to ensure that engagement levels (+1s, comments and shares) match his or her reach. If the numbers measure up, add the person to your potential candidates circle. Don’t assume people will just come to you because you’re awesome. You need to proactively engage with your candidates so they’ll know you exist. To get started, click your potential candidates circle to see members’ content, then start giving +1s, commenting and sharing. Do this often, especially when you’re starting off, to put your content on your candidates’ radar. Once you engage with your candidates’ content, they’ll likely engage with yours and start to connect with you. As they share your content, they spread your message—otherwise known as evangelizing. You’ll soon be able to see who is engaging with you the most. Move the most active candidates to your people who engage circle. Tip: This is also a good time to do a little more candidate prospecting. After you move someone to the people who engage circle, check his or her ripples again to see if you can find someone new to add to your potential candidates circle. As a final vetting step, send candidates in your people who engage circle a special offer with the opportunity to opt-in. This step lets you see who is really interested in your brand and is a true evangelist candidate. When you send an offer by email, respect the relationship you are building. Create an offer that fills the unique needs of the users in your people who engage circle. Think beyond discounts. Maybe host a Google hangout and give your prospects early or exclusive access to new content as incentive to attend. Whatever your offer, make sure it’s special enough that your recipients don’t feel like you’re being spammy by getting in touch through email. By clicking the box at the bottom, candidates will receive an email notification. This is key! In the same email, invite people to opt into your mailing list to receive notifications when you have something amazing to talk to them about. The candidates who take advantage of the Google hangout are definitely good prospects, but those who opt into your email list are your targets. Even if only 30 people out of 100 opt in, you now know who your real evangelists are. Move everyone who opts in over to the my 100 brand evangelists circle. From now on, when you share on Google+, notify your evangelist circle. They in turn will engage and spread the message to their own networks. You may need to go through this process a few times until you find 100 evangelists, but it’s worth it. Word-of-mouth marketing and the partnerships it creates are an important foundation for the rest of your social marketing. Build your list of 100 brand evangelists. Follow these steps to find the influential people who will spread the word about what you have to share. It takes time and effort to find your brand evangelists, but once you have, you’re well on the way to building a stronger community around your brand. Working with people who truly love your brand and want to share it with their own friends and audience will transform your experience on Google+, and may lead to a lift in Google search. What do you think? Have you found evangelists on Google+? How have you worked with them to leverage brand awareness? Leave your questions and comments below.